Expect Miracles Foundation's Miracle Maker Leadership Council (MMLC) proudly presented a total of $30,000 to grantees of the 2013 MMLC Funding Awards at a reception held at the Boston Harbor Hotel. In 2012, the MMLC awarded $23,000 to three Massachusetts-based charities. 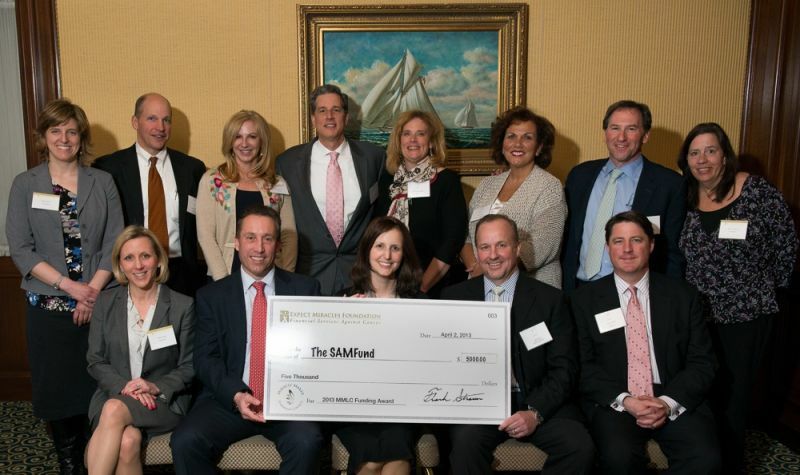 However in 2013, after receiving over 140 grant applications from across the nation, the MMLC expanded its impact across the country—granting $30,000 to four geographically dispersed organizations: Breast Cancer Emergency Aid Foundation of Connecticut, the Evelyn Grace Foundation of California, and two Massachusetts-based charities, The SAMFund and Lucy's Love Bus. Bobbie Doyle started off evening by sharing the moving story of the Evelyn Grace Foundation. |Since inception we have provided $70,000 worth of Evie's Bundles of Love,| said Doyle as she discussed her daughter Evelyn Grace who was the inspiration for the organization after passing away from leukemia only 5 short months after her birth. The MMLC Funding Award will support Evie’s Bundle of Love Program, providing care packages of comfort items and financial assistance to children recently diagnosed with cancer and their families. Samantha Watson took the stage next to receive a check on behalf of the The SAMFund. The grant will help continue and expand a Webinar series titled, “Moving Forward With Your Financial Health,” a cost-effective way to improve financial literacy among young adult cancer survivors. Watson spoke from experience when she said, |together we are going to make amazing things happen in this upcoming year| as The SAMFund was a 2012 grant recipient and has seen first hand the positive impact that a MMLC funding can have on their organization. The third MMLC Funding Award will deliver comfort and quality of life through integrative therapy for children being treated for cancer at several Massachusetts hospitals, and was gratefully received by Beecher Grogan from Lucy’s Love Bus. Grogan stated, “that child was wise, she gave me a mission and a purpose| as she spoke about her daughter, Lucy, who defined the services Lucy’s Love Bus would provide before she passed away from Acute Myeloid Leukemia at the age of 12. The final MMLC funding award will provide financial assistance to breast cancer patients for non-medical needs while in treatment through the “Helping Hand” program. The Breast Cancer Emergency Aid Foundation aims to ease financial burdens that accompany breast cancer so that patients can focus on the more important challenge of getting well. The MMLC is a select group of current and future leaders in the financial community whose mission is to direct funding to cancer fighting causes and patient care programs where such support is not always readily available. To learn how you can join the Council, please contact Christina Thirkell, Executive Director, Expect Miracles Foundation at cthirkell@expectmiraclesfoundation.org or 617.515.3241.